You can always rely on the IFA tech expo for a plethora of new hardware announcements, and IFA 2018 has been no different – and in among the laptops, TVs, smart speakers and other devices, we've seen plenty of wearables make a debut in Berlin this year. To help you work out which of these new products might be worth a place on your wrist, we've put together our pick for the best wearables of IFA 2018. You'll find that below, and if you're in the market for a new smartwatch or fitness tracker you're in the right place. The Apple Watches and Fitbits might grab most of the headlines but Garmin has quietly become one of the most reliable wearable makers out there – you can usually rely on the company to push out devices that work well and look good. The latest in the Garmin line is the Vivosmart 4, now with added blood oxygen saturation measurements for a more detailed look at your health (it's particularly useful for sleep tracking, Garmin says). There's also a new "body battery" feature that combines readings to assess your energy levels and tell you when you're too tired to exercise (for us that's most of the time), plus all the usual tracking options covering walking, running, sleep, swimming and much more. The can be yours for $129.99 / £119.99 / AU$199. Your color options are berry with a gold bezel, powder grey with a rose gold bezel, azure blue with a silver bezel, or black with a slate bezel. 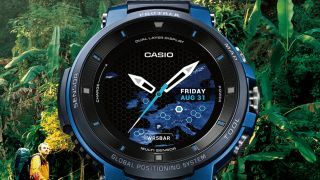 Speaking of hardware makers with a strong wearable pedigree behind them, Casio is back with the Pro Trek Smart WSD F30, which looks to be its best smartwatch yet. There are two main reasons to pick it up: its mapping capabilities and its tough and rugged exterior. This is a watch for the great outdoors, able to survive the worst conditions and get you home safely long after your phone battery has died (the maps work offline too). It comes with the latest version of Google's Wear OS on board, so you get all of the smartphone notifications and Google Assistant functionality you could want, and it even tells the time too. Casio says you'll be able to get a day and a half of use between charges, and you can find out more by reading through our hands on from IFA. As yet we don't have any release date or pricing information from Casio, but this is one to watch out for. In a market where a lot of wearables look similar, raise a glass to the Sony Fes Watch U, which stands out through its use of e-Paper technology for the screen rather than the traditional LCD or OLED displays. The e-Paper extends around the strap too, and what that means is you get complete control over the design of your watch (as long as you don't want to use any color). There are 100 designs included, but you can easily make your own. There are some drawbacks here, with no support for third-party apps and Sony's own wearable software, which isn't as intuitive as Wear OS or watchOS. Considering how innovative it is though, we'd say it's still in credit – see our IFA hands on for more. You'd better start saving if you want to buy this – it's going to cost you from £529 (about $690). It goes on sale in the UK, Italy, France, Germany and Spain to begin with. Don't worry if you missed out on the Skagen Falster because the sequel is here and it's packed with many more features – it's ideal for those who want a smartwatch that looks the part but also has a lot of functionality to explore too. That functionality covers heart rate monitoring, NFC (for mobile payments), and on-board GPS so you can find your way home or track the route of your morning jog even when you don't have your phone with you. It's waterproof too, ready for the shower or the swimming pool, and two of the buttons are programmable so you can set them up to launch whatever apps or functions you want. Wear OS is running everything, so you get all the usual Google Assistant tricks and smartphone notifications. We're not sure exactly when this is going to go on sale yet, but the starting price is pegged at $275 (about £210) – check out our hands on for more. The Diesel On Full Guard 2.5 says: you like chunky smartwatches, and you're not worried about who knows about it. This is a wearable that adds some serious heft to your wrist. In return for that extra weight you get a ton of functions and features: NFC so you can pay contactless with a tap, heart rate monitoring, and integrated GPS. Diesel says the watch can last for a couple of days from a single charge which is fine by us. We also know Wear OS is on board, Google's mature mobile operating system for the wrist. You'll be able to call up Google Assistant, get directions, read your texts and more with the Diesel On Full Guard 2.5. For the time being we don't know how much this is going to cost but Diesel says it's going to go on sale in October. Get ready – if you think your wrist can take it. Lastly an honorable mention for the Fitbit Charge 3, which was actually announced before IFA got underway but is still technically one of the products officially unveiled in Berlin. You know what you're getting with a Fitbit device – lots of tracking, top-notch software, and a wearable that's going to last. The Charge 3 ups the ante with a screen that's bigger and more touch-friendly than the Charge 2. Add in advanced tracking for just about any kind of activity – including swimming and sleeping – plus notifications from your phone and even app support, and you've got a fitness tracker that's almost a smartwatch. You can get your order in now with shipping in October: the band costs from $149.95 / £129.99 / AU$229.95, and comes in a variety of colors and with a variety of straps. You can get a taste of what to expect with our hands on.